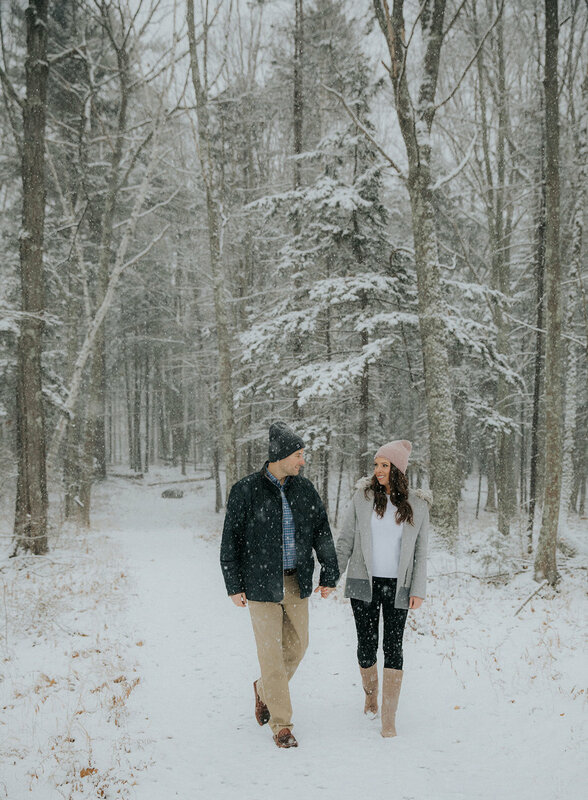 We had planned to meet up with Mark and Liz for awhile after they booked us for their Maine wedding, but had no idea that on the day our engagement shoot was we would wake up to the most beautiful winter wonderland! Taking photos in the snow is really tricky, sometimes it's too heavy, sometimes it's too light, sometimes it's so cold that people have a hard time focusing (and we do too!) but on this particular day in December the temperatures were still above freezing and we met up with them at one of our favorite venues in Wells, the Wells Reserve aka Laudholm Farm. It was so silent and beautiful there and we had so much fun walking around with Mark and Liz and getting to know them. This session was a bit quicker than our typical one due to the temps (and we all had frozen hair by the end!) but was so wonderful. We are really looking forward to seeing Mark and Liz again at their June wedding at the Cliff House!